View our diamond pendants here. Giving her the gift of a diamond heart necklace is like giving her a piece of your own heart and soul. Gifts such as these have been given for many years with great success and for good reason. These diamond pendants are absolutely beautiful and they will make every girl feel special like she deserves. A diamond heart necklace is a popular gift not only because of how attractive it can be but because it is something that everyone can wear. No matter what age you are, young or old, you will be able to wear a heart-shaped necklace and look amazing. You will find heart-shaped necklaces in many styles. Some of these gorgeous necklaces are abstract hearts while others are more traditional and symmetrical looking. You will also be able to choose your metal type for the pendant - yellow gold, white gold, or platinum. You will find some of the most beautiful diamond heart necklaces at Novori. We have many different styles for you to choose from at great prices. All of the jewelry at Novori is of the highest quality and is backed with a lifetime guarantee. We work with the best materials and bring you some of the best designs in the world. 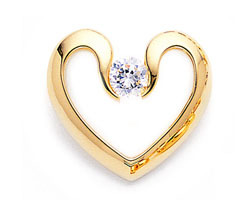 Diamond heart necklaces are not the only style of heart pendant that you can find. You will also find a large selection of different gemstone heart necklaces. While diamond heart necklaces are a great gift there is no reason why you cannot buy one for yourself. If you have always wanted to have your own gorgeous necklace, why not start shopping for yourself?